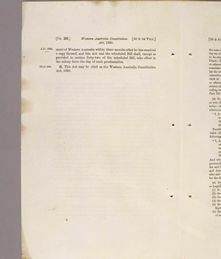 This document, the Assent original of an Act of the British Parliament, enacted the Constitution passed by the Legislative Council of Western Australia in 1889. 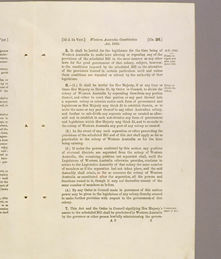 The passage of this Enabling Act represented the culmination of a slow process of transition from rule by the Governor with the assistance of an appointed Legislative Council, to a representative democracy. The Legislative Council consisted only of officials until 1838, then of nominated non-official members and officials until 1870 and, finally, from 1870 to 1890 developed into a system of representative government with a Legislative Council with two-thirds of its members elected by voters subject to a propertied franchise. 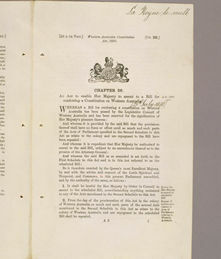 Because Western Australia had not been included under the provisions of the Australian Constitutions Act 1850 which granted the Colonies control over their own waste lands, the 1889 Constitution Bill had to be referred to Britain for ratification by the Imperial Parliament before it could receive the Royal Assent: the Constitution itself was included as a Schedule to this Act. 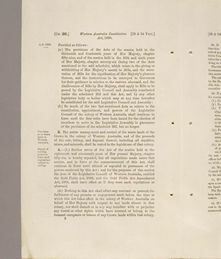 Despite urgent negotiations, the enabling Bill (with the reserved Bill incorporated as a Schedule) did not pass through both Houses of the British Parliament until July 1890. 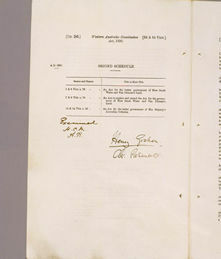 This was only achieved after a delegation was sent from Western Australia to London to appear before a Parliamentary Select Committee which, after 12 meetings, produced a generally favourable report. 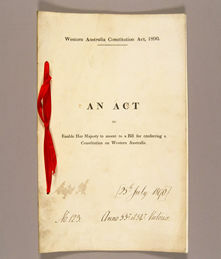 The Western Australia 1889 Constitution Act finally became law when it received the Royal Assent on 15 August 1890, and came into operation when proclaimed in the Colony on 21 October.